Option A – 1 Year/6 pamphlets: U.S.
Pendle Hill pamphlets are concise, intended to be read easily in one sitting. They make wonderful gifts for your family or new members of your Quaker Meeting. 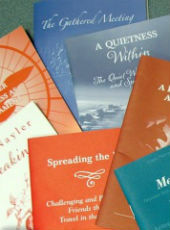 Your subscription now includes 6 pamphlets per year, sent to you as soon as they are printed. We pay the postage. This subscription type is for U.S. addresses only.